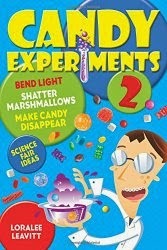 We had a bunch of kids over this afternoon for candy experiments. Little kids like the science when you show it to them, but they do just fine without the explanations. They loved squashing Peeps marshmallows, making Peeps sandwiches, and pouring hot water over stacks of Peeps, candy cane, and licorice. We ended up with a lot of "Candy Soup." The kids' favorite discovery: Peeps get slimy when you dissolve the sugar off.